The rise in average temperatures is apparent across the country, and has been most obvious in the past 25 years. Nevertheless, Slovenia is encountering even greater and more significant deviations with regard to precipitation, where considerable differences among regions can be observed. In addition, precipitation trends are quite different compared to temperature trends. A prominent decrease in annual precipitation can be observed in certain areas, whereas a slight growth has been noted in the Julian Alps and the Dolenjska region. The indicator shows the movement of average annual air temperatures and average annual precipitation in selected areas across Slovenia in the period of 1961-2008. Regular monitoring of the trend of temperatures and precipitation allows for the determination of long-term changes in the environment, preparations for newly arising conditions and mitigation of possible adverse consequences. The average temperature in 2008 importantly exceeded the long-term mean; however, despite that fact, the temperature was slightly lower than in 2007. Western Slovenia received more than 2000 mm of precipitation, while the lowest share was recorded in the northeast of the country. The long-term precipitation average was exceeded in most parts of Slovenia, the exception being southwestern, northeastern and eastern Slovenia and part of Karavanke. Northwestern Slovenia received the greatest share of precipitation that exceeded the mean, while Maribor and Murska Sobota received the least precipitation with regard to the long-term mean. The length of solar radiation was below average in northwestern Slovenia, Savinjska dolina, parts of the Koroška region, southwestern Slovenia, and southern parts of the country. The highest share, more than 10%, was recorded in northeastern Slovenia, northeast of the Drava River. Average annual temperatures across the country in 2007 exceeded the long-term mean. More than 2°C warmer temperatures were recorded in the Ljubljana region with its greater surroundings, northeastern and eastern Slovenia, with the exception of Bizeljsko and parts of the Prekmurje region. Other parts recorded temperatures that were warmer by 1°C. 2007 is considered to have been the warmest year so far, where the temperatures peaked at the coast. The long-term average of sun radiation was exceeded across Slovenia, while in most parts of the country, the average was exceeded by 10-20%. The long-term precipitation mean was exceeded in the Koroška region and parts of the Štajerska, Prekmurje, Bela krajina regions and Bizeljsko, while the rest of the country received 80-100% of the long-term average. The average annual temperature in 2006 was above the long-term mean everywhere, and in some parts, temperature deviation exceeded 1.5°C. There was more sunny weather than usual (except for the Slovenj Gradec basin), and in most parts of the country, the surplus amounted to up to 10%. The long-term precipitation average was exceeded only in Murska Sobota and its surroundings; most parts of Slovenia received between 80 and 100% precipitation, while Vipavska dolina and Lesce received the least precipitation in relation to the mean. Temperatures depend on the altitude; therefore, Kredarica is the most apparent for its low temperatures, followed by Rateče. 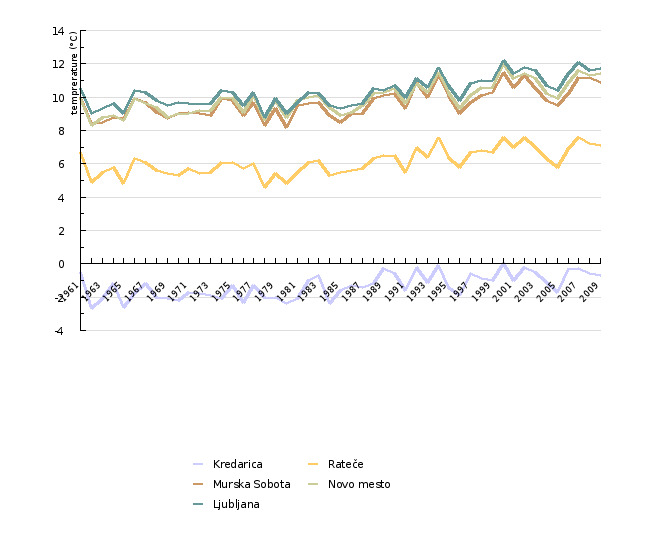 During the 1961-2008 period, 1962 was recorded as the coldest year on Kredarica and in Novo mesto, 1978 in Rateče and Ljubljana, while 1980 was the coldest in Murska Sobota; 2000 was recorded as the warmest year, while 1995, 2002 and 2007 were recorded as the warmest in Rateče. The summer of 2003 was exceptionally hot. The rise in average temperatures is also apparent across Slovenia, and this has been the most obvious in the last 25 years. Nevertheless, Slovenia is encountering even greater and more significant deviations with regard to precipitation. There are considerable differences among regions, since average annual precipitation in individual areas within the Julian Alps reach as much as 3500 mm, while towards the east, the amount of precipitation is rapidly dropping, reaching an annual average of a mere 800 mm in the easternmost part of the Prekmurje region. A glance at table 2 reveals great differences among the areas: Kredarica received the largest share of precipitation, while Prekmurje received the smallest. During the period in question, Kredarica received the largest share of precipitation in 1987, and Ljubljana and Murska Sobota in 1965. 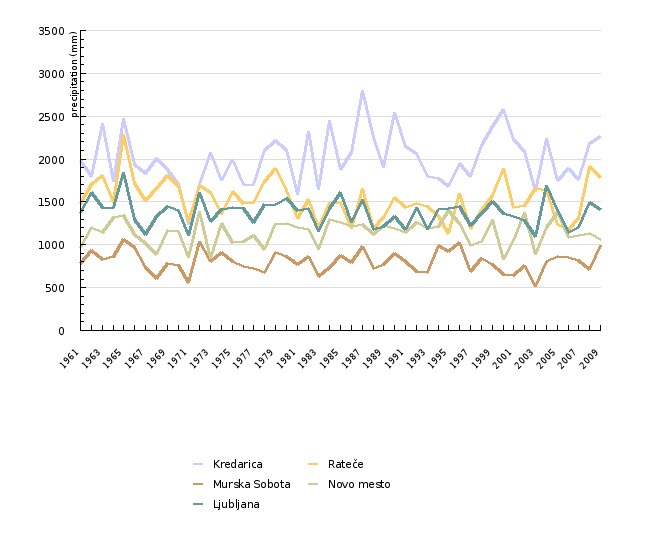 Ljubljana and Murska Sobota received the lowest share of precipitation in 2003, and Kredarica in 1971. Furthermore, there are also apparent differences at each measuring station during the course of individual years. In addition, precipitation trends are quite different compared to temperature trends. A prominent decrease in the share of annual precipitation can be observed in certain areas, whereas a slight growth has been noted in the Julian Alps and the Dolenjska region. Yet, even more troubling than the variability in annual precipitation are the deviations from average values that occur within shorter time spans (such as periods of several days, months or seasons). The consequences of precipitation deviations from normal values may be manifested as droughts, floods or landslides. In 2003, agriculture was badly hit by a drought; in addition to an extreme lack of precipitation, severe sunny and warm weather further worsened the situation. Torrential floods, on the other hand, may already result from exceptionally heavy rainfall appearing over a very short interval of time; on 18 September 2007, torrential floods and landslides in the Gorenjska and Štajerska regions claimed human lives and huge economic damage. Slovenia is therefore very likely most sensitive to climate changes in the areas that are vulnerable to the consequences of precipitation variability. Methodology and frequency of data collection for the indicator: The data is presented for the 1961-2008 period. Data processing methodology: The data is presented in °C and mm. Kredarica is representative of conditions in high mountainous regions; while the conditions around the Rateče monitoring station have not changed for decades. The Rateče monitoring station is representative of valley conditions in northern Slovenia, while the Murska Sobota monitoring station represents conditions of the flatland in northeastern Slovenia, where continental climate is the most typical in the country. Novo mesto is a typical representative of the climatic situation in the Dolenjska region. The surroundings of the Ljubljana measuring station have undergone significant changes during the recent decades; the data is nevertheless representative for the climate conditions in the city that is both the capital and the largest city in Slovenia. Yet, it should be emphasised that this data is suitable neither for the illustration of changes in the climate conditions within a wider area nor for the assessment of changes arising directly from global climate changes. Temperatures depend on the altitude; therefore, Kredarica is the most apparent for its low temperatures, followed by Rateče.